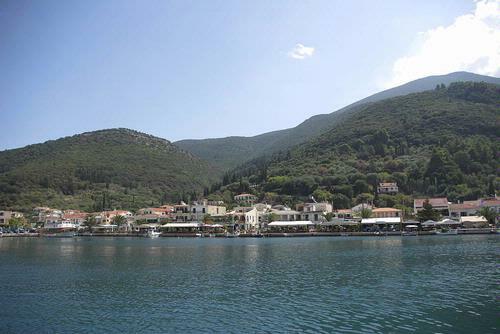 There are many bars, restaurants and tavernas overlooking the picturesque harbour at Sami. Situated on the east coast of the island, Sami is a major ferry port with ferries to Patras and Kilinni on the mainland, the island of Ithaca and in high season Corfu and Italy. The town was rebuilt after the earthquake and offers a good selection of hotels, restaurants, tavernas, shops, a bank and post office. It has a wide seafront and the main beach is some distance to the north at Karavomilos. Sami doubled for Argostoli during the filming of the motion picture Captain Corelli's Mandolin. Approximately 3 kilometers distance away lies the perfect horseshoe bay of Antisamos with its white shingle beach. There are a number of archaeological sites including what is believed to be a Roman Baths which is to be found at the foot of the Agii Fanentes hills above Sami. On the road from Argostoli to Sami can be found the Drogarati Cave which was discovered 300 years ago sfter a strong earthquake. The caves are 60 m. below ground level. A short distance to the north of Sami at Karavomilos can be found the underground Melissani Lake, which is open to the public. The roof of the cave fell in during an earthquake in the distant past, thus allowing sunlight in. The sun reflects into the water and produces beautiful colours of blues and greens and turquoise. 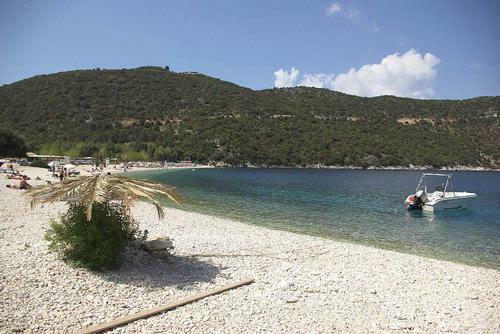 Anti-Samos beach is just a short drive from the town of Sami. The waters of the lake rise from a deep cave system which originates at The Katavothres swallow holes in Argostoli on the west side of the island. The water then flows underground across the island to emerge here on the east side. The water eventually discharges into Sami bay. Archaeological excavations in the cave system have brought to light many significant relics. There is a fantastic beach just a short drive away at Anti-Samos.